You need to stay comfortable in your home throughout the entire year, which means that you have to rely heavily on your heating and air conditioning systems to keep your home at your desired temperature. If your system needs any kind of service, call Quality Air Heating and Air Conditioning. We offer a full line of heating and air conditioning service in Powell, OH for many different types and brands of systems. From new equipment installation to repairs for your existing system, just give us a call and one of our friendly specialists can talk with you about any services that you need. Here at Quality Air Heating and Air Conditioning, we prefer to do business a little differently than other HVAC contractors. We view our customers as our boss because without you, our loyal customers, our business wouldn’t exist. It’s this view that motivates us to provide each of our customers with the best possible service we can. Give us a call to schedule heating and air conditioning services in Powell, OH and the surrounding area. Keep your heating system operating properly with top notch service from Quality Air Heating and Air Conditioning. We provide total heating service in Powell, OH for many different types of heating systems, so call us today if you’re interested in having a new system installed or if you need repairs for your furnace, heat pump, or ductless mini split. We’re available 24/7 for Powell, OH heating repair service, so call us anytime. We also offer heating maintenance which includes annual visits which could reduce repair needs and extend the life of your heating system. Your heater gets a lot of use throughout the winter which can cause it to develop a number of common problems. If your heating system isn’t producing enough heat or if it’s making a new or unfamiliar sound, call immediately for heating repair from the experts in Powell, OH at Quality Air Heating and Air Conditioning. We have years of experience dealing with all kinds of heating issues for many different types of heating systems. If you heater breaks down unexpectedly in the middle of the night, don’t worry: we’re available 24/7 for emergency heating repair in Powell, OH. Having your new heating system installed by a professional is probably one of the best things that you can do for the life and efficiency of your new heater. Whether it’s a furnace, heat pump, ductless mini split, or geothermal system, call the Powell, OH heating installation experts at Quality Air Heating and Air Conditioning. We will help you find a great new system so that you don’t have to figure the whole process out by yourself. Call us today to talk with one of our friendly technicians today. Heat pumps are a type of heating and air conditioning system that is able to both heat and cool your home. While many other types of heating systems, like furnaces, need to consume a fuel like gas in order to heat your home, heat pumps actually absorb ambient heat in the outside air and move it into your home. If you’d like to learn more about heat pumps or if you need heat pump service in Powell, OH just give us a call. Furnaces are the old stand-by for homeowners because they provide such comfortable and efficient heating. If you need furnace repair in Powell, OH or if you need to have a new one installed in your home, you need to work with a contractor that you can trust. 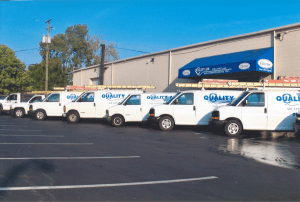 We here at Quality Air Heating and Air Conditioning are dedicated to the quality of service that we provide and to the satisfaction of our customers. Call us today if your furnace is blowing cool air and you need furnace repair in Powell, OH or if you need any other kind of service like installation, maintenance, or replacement. Is your air conditioning system breaking down frequently? Are you on the market for a new AC system? For quality air conditioning service in Powell, OH call Quality Air Heating and Air Conditioning. We are dedicated to the quality of work that we do and our highly trained technicians can perform repairs or installation on all types of AC systems. We know that finding a new air conditioning system for your home is a big task and our technicians will help you through the entire process. From finding the right unit for your home to the actual installation, let Quality Air Heating and Air Conditioning make sure that your air conditioner works well and lasts for as long as possible. We’re available 24/7 for emergency air conditioning repair in Powell, OH so call us anytime and you’ll always get a live person on the other end of the line. Whether your heat pump is icing up or your central air conditioning system isn’t producing enough cooling, call Quality Air Heating and Air Conditioning anytime for quality air conditioning repair in Powell, OH. We work hard on every job to provide each of our customers with the high level of workmanship that they deserve. We take your comfort seriously and we consider you our boss, so call us today whenever your air conditioner starts to cause you any problems. Don’t let an amateur or non-professional handle the installation of your new air conditioning system. If you want a lasting and efficient performance from your system, you have to get it installed professionally. Quality Air Heating and Air Conditioning offers exceptional air conditioning installation in Powell, OH for all kinds of AC systems. From heat pumps and ductless mini splits to central AC and geothermal systems, our expert technicians can handle any job that you need. We’ll also help you find a terrific AC system for your home that fits your budget and your home’s needs. Call us today! Your air conditioning system works hard throughout the year to keep you comfortable, and all that work can cause it to develop many kinds of issues. Without maintenance, those types of small problems will likely develop into more costly repairs. But with air conditioning maintenance, you could be able to prevent problems from happening, increase the efficiency of your AC unit and also extend its life. Call Quality Air Heating and Air Conditioning if you’re interested in air conditioning maintenance in Powell, OH and we can set you up with regular visits. Also, our maintenance program members receive discounted rates, priority service and extended warranties. While air conditioning systems are designed to last for many years, they will eventually break down permanently and require replacing. If your AC system is experiencing frequent repairs, if it can’t keep your home comfortable or if it won’t start up, call Quality Air Heating and Air Conditioning for air conditioning replacement in Powell, OH. We can talk with you about your AC options and then help you pick out a new system that fits your needs as well as your budget for the project. Call us today and one of our friendly experts can help you with any services that you need. Make sure that your business’ HVAC system is up to the task of keeping your customers comfortable throughout the year with commercial HVAC service in Powell, OH from Quality Air Heating and Air Conditioning. Over the years, we’ve worked with all different kinds of businesses and our HVAC experts can install, repair, service, and replace all kinds of commercial HVAC equipment. For new installation, we can help you pick out a new system and make sure that it is the right size for your business. We also offer 24/7 emergency commercial HVAC repair in Powell, OH so call us anytime and we can help you get your HVAC system back up and running again. Is your business not getting enough heating or cooling? Is your system producing an unfamiliar noise? Quality Air Heating and Air Conditioning is here with all the commercial HVAC repair in Powell, OH that you could ever need. We’ve fixed all kinds of issues and our technicians specialize in finding problems quickly and getting them fixed even faster. Call us 24/7 for commercial HVAC repair in Powell, OH and you’ll always get a live person on the other end of the line. While it can be tempting to allow someone that you know to install your new commercial HVAC system, it likely won’t turn on that well. In fact, poor installation is one of the leading causes of HVAC problems and repair needs. That’s why you should call Quality Air Heating and Air Conditioning for commercial HVAC installation in Powell, OH. Our experienced specialists can talk with you about which type of system you’d like installed or we can also help you pick out a new system that fits your business’ needs and your budget. Our technicians are standing by to take your call, so contact us today. Business owners rely on their HVAC system to keep their customers and employees comfortable no matter what the temperature is like outside. One of the best ways to ensure that your system operates properly and consistently is to get it maintained. Quality Air Heating and Air Conditioning offers commercial HVAC maintenance in Powell, OH for all types of systems. Our maintenance program includes annual visits, reduced pricing, extended warranties and much more. Plus, regular HVAC maintenance could increase the efficiency of your system, reduce repairs, and also extend its life.